I have been working from home since November 2006. I knew it was inevitable about year in advance due to the growth of my company. My husband was worried I would feel isolated by not leaving the house. I try to leave everyday even it is just to run out to the supermarket for a few things. I had a hard time adjusting at first. I have learned to make a conscious effort to call colleagues. 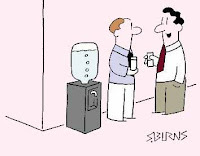 I call this my “water-cooler time” I only see a small portion of people I work with and the majority of our meetings are phone and video conferences. In an office setting you have 5 minutes walking from the car to the office to ask Mary about her grandkid's birthday party and 2 minutes walking down the hall to get a drink to see if Brad was able to resolve the contract issue from yesterday. We are social beings. I make a conscious effort to speak with people. It is important for our team to bond if people are conscious of it or not. Great business ideas and best practice learnings often come out of informal chats. Don’t get me wrong. I am not saying I chit-chat all day with colleagues instead of recruiting. Just the opposite is true. Ten minutes to breathe is necessary to refocus and keep you in the game after several back to back interviews. Subscribe to “Through The Eyes of a Recruiter” via Email!